To help people who have lost a limb due to accident, military service, or disease, replacing that limb with something as serviceable as possible is the ultimate goal of prosthetic researchers. For the amputee, a functioning bionic limb is perhaps the “Holy Grail” of limb replacement. This is the third and final installment of Neurobionics in Prosthetics, a series that attempts to connect similar advances in prosthetic technology with the concept of the bionic limb, a far more functional and intelligent prosthesis than the simple prosthetic devices available today. Last time, discussed the second major technological breakthrough in this series with an amazing study being conducted in the field of neuroprosthetics, a technology that brings us one step closer to the truly bionic limb. This week, we will conclude this series with a discussion of how a brain-computer interface made wireless robotics history, then we are going to put all this new bionic tech together. Up to this point, we have examined how researchers have connected tactile sensory feedback, or haptics between amputees and prosthetic attachments and using functional electrical stimulation (FES) to stimulate muscles or nerves to produce muscle contraction and restore motor function. The final leg of our journey takes us to wireless Brain-Computer Interface (BCI), technology designed to allow a subject to wirelessly manipulate a robotic limb. This story is about a paralyzed woman has used mind power and a robotic arm wirelessly connected to her brain to achieve the most dexterous movement yet accomplished with BCI (previously called, Brain-Machine Interface, or BMI). (Note: This is a reprinting of the original article). Scientists have enabled a quadriplegic woman to successfully use a brain-machine interface (BMI) to move an advanced robotic arm in the most complex ways yet accomplished using the technology. In 2012, scientists at the University of Pittsburgh School of Medicine implanted two electrodes with dozens of contact points into the brain of Jan Scheuermann, who was paralyzed from the neck down in 2003. 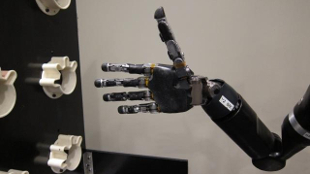 In initial trials, Scheuermann successfully used her thoughts to wirelessly manipulate a robotic hand, reaching in three dimensions, flexing the wrist, and gripping objects. In a new BMI study published this week (December 16) in the Journal of Neural Engineering, researchers led by the Pitt’s Jennifer Collinger reported even more impressive feats of mid-controlled robotic motion. After additional training, Scheuermann successfully controlled the robot arm as it picked up large and small boxes, a rock, a ball, and tubes of varying dimensions. “Our project has shown that we can interpret signals from neurons with a simple computer algorithm to generate sophisticated, fluid movements that allow the user to interact with the environment,” said Collinger in a statement. So, where do all these technological advancements this lead us? I think that they lead us to a completely bionic limb – when the technology is fully tested and ready for mainstream medical use. Amputees have seen some advancements in prosthetics over the years, but basically, they have been ergonomic and mechanical improvements, for the most part. Now, we can see actual laboratory evidence for the real possibility that those limbs will one day be connected to the subject’s brain – wirelessly – and fully functional, with sensory feedback. What we can envision for the near future is no longer simply a mechanical prosthetic, but a truly bionic prosthesis. With more technological breakthroughs like these, one day, amputees could be experiencing a quality of life with bionic limbs in much the same way as everyone else does with muscle and bone. Krucoff, Max O.; Rahimpour, Shervin; Slutzky, Marc W.; Edgerton, V. Reggie; Turner, Dennis A. (2016-01-01). "Enhancing Nervous System Recovery through Neurobiologics, Neural Interface Training, and Neurorehabilitation". Neuroprosthetics: 584. Meek SG, Jacobsen SC, Goulding PP. Extended physiologic taction: design and evaluation of a proportional force feedback system. J Rehabil Res Dev 1989;26(3):53–62. Patterson PE, Katz JA. Design and evaluation of a sensory feedback system that provides grasping pressure in a myoelectric hand. J Rehabil Res Dev 1992;29(1):1–8.